The world of interior design is an ever-evolving, fast-paced industry where creative possibility is seemingly endless. When you come to redecorate your home, there are so many routes you can go down, so many colours and textures and styles to experiment with. Thankfully we have a whole other world of inspirational and useful content dedicated to helping guide us through the decision-making process, in the form of interiors magazines and blogs dedicated to covering many aspects of design. But finding design inspiration in unexpected places can give us the opportunity to spark ideas we never thought we could explore. I have found that, since starting my interior design blog 18 months ago, my own style has changed and evolved into another dimension. A lot has had to do with meeting other creative people and attending trend based events, but probably more central to this has been that my eyes now tune into other businesses and creative based industries. A good example of this shift and one that had bypassed me for so long is garden design. How shapes and textures and patterns form a garden or outside space. I’ve got some amazing ideas on colours that have wowed me, seeing how colours in nature blend and work seamlessly together, inspiration on creating functional yet beautiful spaces, making the most of a pretty feature, viewpoints from different angles, and the effect that light has on all of those things. All of these elements I have used to help and inspire my own thought process and style choices when designing and decorating spaces. A pivotal moment last year resulted in a new eye searching for unusual links in design. During the summer I attended Concours of Elegance, an annual and world-renowned vintage car exhibition held at Hampton Court Palace. I went primarily because I love cars but the day also taught me some key lessons about good design, one of which I learned from a motor journalist during my visit. He said “look at a car once, turn away, and if you can still remember how that car looked – that’s good design” – the same could apply to one’s interior design or outfit for the day. I’ll never forget that, the last thing I expected to take away from the day, but a question I now ask myself all the time if I see something I want to buy or styles I’m drawn to in magazines and books. I thought I would share a few more areas which could help inspire your design ideas, some of which are a little different, others which are more obvious but worth exploring a bit more perhaps. 1. FASHION SHOWS: The lines between fashion and interiors are becoming increasingly blurred. For me, it’s all about picking out colour, texture and detail and how these all come together in eye-popping outfits. I always use Burberry as a reference point, season to season, and eagerly watch the reply of the show online to get ideas from. 2. COOKERY BOOKS: A weird one but I always scour through cookery books for styling inspiration. It’s often not the food itself, but the background, the props and the lifestyle imagery that the recipes are shot within which is so inspiring. I particularly love Jamie Oliver cookbooks as the styling is often cool, quirky and spontaneous. 3. TV AND FILM SETS: Decor featured on film sets are just so amazing, unique and awe-inspiring. I love to tap into fantasy worlds and see what details I can take from them. A recent favourite was period drama, Taboo featuring Tom Hardy with it’s super dark and mysterious Georgian interior splendour. 4. HOTELS AND RESTAURANTS: A popular one for design lovers, visiting the newest and coolest restaurants or hotels out there is a must. The budgets for these high-end commercial spaces are ridiculous and the designers have the luxury of really going to town with schemes that would normally be too outrageous for domestic living. There are often themes and colour schemes you can take from them and adapt for your own home. 5. HISTORICAL PROPERTIES: It’s always good to re-visit history and visiting a good old National Trust property is a great starting point. Symmetry and proportion in old houses and estates were done to perfection with grand, dramatic and highly decorative spaces and exquisite detail on show. Always an inspiration to study and learn more about. So there you have it, a few ideas for finding design inspiration in places you could visit or things you could do to develop your own eye for style and pick up those special details. 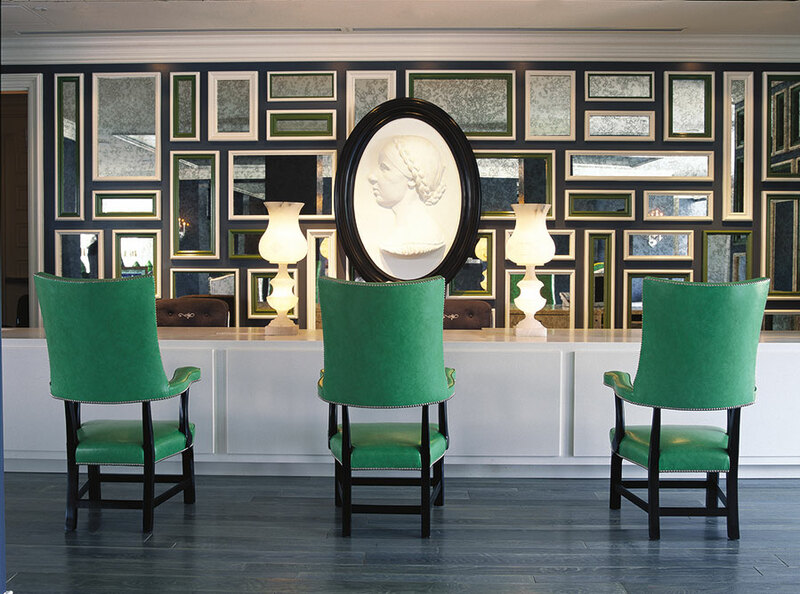 Photo credit: Viceroy Hotel, Santa Monica as featured in Estila Volume 1.